The old-timers would construct diversions out in the active river to direct the water’s flow around where they wanted to dig. When looking at these single, stand-alone rock piles along our mining properties, it is important to understand what they are. Most of them were not formed off the backside of some massive gold recovery systems. In other words, they are not actually “tailings.” The huge single piles, as we see them on some of our mining properties, were mostly associated with large, mechanized derricks. These were used to drag buckets of material and boulders out of large hand-excavations that were being dug out in the river – or sometimes in the bars alongside the river. The old-timers would construct diversions (called “wing dams”) out in the active river to direct the water’s flow around where they wanted to dig. Then they would roll and shovel streambed material into a large bucket or sling down in their excavations and use the derrick (often powered by a steam winch) to drag the material out of their way and into huge piles alongside their active excavations. They did this to get themselves down to the deeper pay-layers, just like we do these days. In other words, the material you see in these piles consists of the overburden and big rocks that the old-timers dragged out of their holes so that they could gain access to the richer pay-layers that were present deeper in the streambed. Most often, the material you see in these big piles on the banks was never processed for gold-content. This explains why some of our members are already starting to recover gold out of the huge piles on one of our new claims. It also explains why some of our members have been doing so well processing the huge piles along other sections of the Klamath River. 1) Wherever you see them, you know the old-timers were working very rich ground. Because, even though a mechanized derrick was used to drag the material into a pile, it was all hand-work that placed the material into the buckets in the first place. Take a look at the size of those piles! They represent an enormous amount of organized physical effort! That labor had to be paid for. Mining companies paid for labor to perform that much work only because they were getting a return on their investment! 2) When you see more than a single huge rock pile in proximity, you know that the labor was paying off. Miners do not make repeated blunders in proximity. This new claim at K-2A has lots of huge piles. The whole Gottville mining district has them! 3) Since the rock piles did not wash away in the major flood events which occurred since they were made, we can look at the piles to get a good idea where the old-timers mined the claim. Looking at the piles, it looks to me like most of the property has yet to be mined. There will be serious, original (virgin) gold deposits present there. This is the reason we have been quietly, patiently waiting for our opportunity to buy the property. 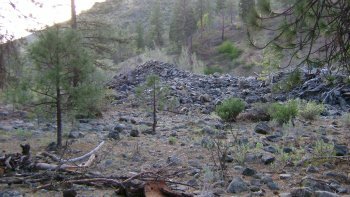 4) We must keep in mind that there was zero flood control (dams) on the Klamath River at the time when these rock piles were created. This means that all of the work to create the diversions (wing dams) and dig the excavations had to occur likely between the months of July through October. The first big rain in the fall would have put an end to the entire investment for that particular season. Following winter storm events will have completely buried the excavations. This means there was a short life span on each excavation where you see the rock piles. 5) It is likely, in many cases, that more time and effort was invested into getting an excavation down to the pay-dirt, than the time and effort invested into working the rich material. 6) No question, whatever was remaining of exposed pay-dirt had to be abandoned once the first flood event of the rainy season arrived. 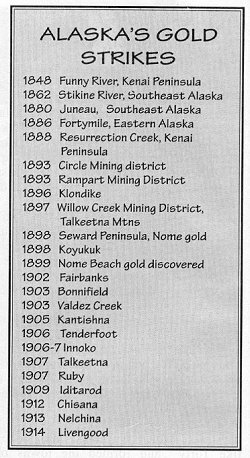 While it is likely that some mining companies returned to the same places during the following year, I’m certain that many did not. The fact that you don’t see continuous piles up along the whole river is evidence that much of the area remains un-mined. Good thing the old-timers did not have access to modern suction dredges or the whole claim would have been mined out! 7) Since a mechanized derrick could drag material from a long distance away, the height of the pile is not a read on how deep the streambed material is in the river. But you can look at the size of the piles to get a reasonable idea how big the excavation was in the river or on the bar. 8) To some degree, you can expect that a lot of the material you will find at the top of these rock piles will be from the places closest to the pay-layers which the old-timers were working. Add 60+ years of natural weathering (heavy rains), and you can find some nice gold concentrations in some of these piles. Otto Gaither showed me quite a stash of gold that he and some of his friends were mining out of one of their secret rock piles on the river several years ago. The gold was so good that I actually went to look at the pile. They were getting their gold right out of the top! 10) By now, everybody ought to know what hard-packed streambed is. This is compacted gravel and rocks which is laid down in layers during major flood events. Nearly all the high-grade gold we are going to find in the river or on the bars is going to be associated with hard-pack. I cannot overstress the importance that you need to know what hard-pack is. If you don’t, I strongly urge you to read my books and/or attend our scheduled weekend mining projects. 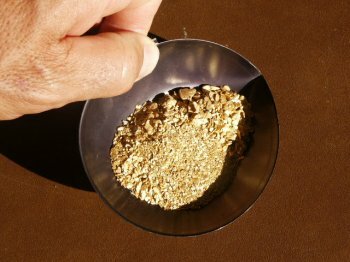 There is a learning curve to prospecting for high-grade gold. The sooner you get through it, the sooner you will be pleased with your results. We are here to help. But it is up to you to make use of the services which we provide to help all members. 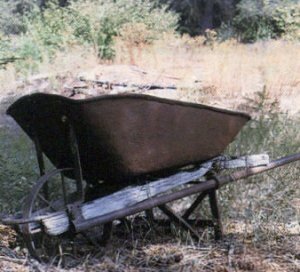 What was an “Irish baby buggy?” It was a slang expression for a wheelbarrow. A “Cackler” is what they called a miner who let others do the heavy work. “Johnny Newcome” was a novice miner. Don’t forget the “Little Red Wagon.” That’s what those traveling toilets they had at some mines were nicknamed in the old days. Modem miners, no doubt, have their own slang; but the language used by miners years ago was very interesting. And fun, too! A “Nipper” was a boy who ran errands for miners. A “Shoofly” was a transverse passage in a mine. How about “Red?” That’s what they used to call gold. Why? It’s a bit of a mystery. “Blue?” That’s what they often called silver? Once again, you figure it out. As for “Sparkle,” well, that’s an easy one. That’s what they used to call diamonds. A “Tool nipper” was another name for a youngster who worked in the mines. “Sourdough” was a miner who came south from Canada seeking to make his fortune in America. Most of the “Sourdoughs” returned home with empty pockets. To “break one’s pick” was to become discouraged, and quite a few miners did. 1. Glory hole; 2. Muck; 3. Nosebag; 4. Powder monkey; 5. Slave markets; 6. Aladdin’s lamp; 7. The picklock that never fails; 8. Buzzard dollar. Last but not least: What is a “Boar’s nest?” That’s a mining camp where women are not allowed. The following article has been reprinted from the NEW YORK DAILY TRIBUNE, Saturday’s Evening Edition, December 9, 1848. At present the people are running over the country and picking it out of the earth here and there, just as a thousand hogs, let loose in a forest, would root up ground nuts. Some get eight or ten ounces a day, and the least active one or two. They make the most who employ the wild Indians to hunt it for them. There is one man who has sixty Indians in his employ; his profits are a dollar a minute. The wild Indians know nothing of its value, and wonder what the pale faces want to do with it; they will give an ounce of it for the same weight of coined silver, or a thimbleful of glass beads, or a glass of grog. And white men themselves often give an ounce of it, which is worth at our mint $18 or more, for a bottle of brandy, a bottle of soda powders, or a plug of tobacco. As to the quality which the diggers get, take a few facts as evidence. I know seven men who worked seven weeks and two on Feather River; they employed on an average fifty Indians, and got out in these seven weeks and two days, 275 pounds of pure gold. I know the men and have seen the gold, and I know what they state to be a fact so stick a pin there. I know ten other men who worked ten days in company, employed no Indians, and averaged in these ten days $1,500 each; so stick another pin there. I know another man who got out of a basin in a rock, not larger than a wash bowl, two and one-half pounds of gold in fifteen minutes; so stick another pin there! Not one of these statements would I believe, did I not know the men personally, and know them to be plain matter of fact men-men who open a vein of gold just as coolly as you would a potato hill. The BOSTON COURIER publishes the following letter, received by a merchant in that city from his correspondent at San Francisco. SAN FRANCISCO, August 20, 1848–The wonderful developments of the gold region in California, and the flocking of all classes of people to gather it, have deranged all the calculations of the hide and tallow voyagers. The rancheros having all left their farms and their regular occupations, there will be no killing of cattle this year around this Bay, nor upon the whole length of the coast. The Tasso has just arrived from leeward, and has collected only 50 hides at all the different ports on her passage up. On arriving here, ships are left without crews in twenty-four hours. Whalers’ men desert, even from full ships, and if a sailor is induced to remain on board a vessel, it is at from $40 to $50 per month. I have some hundred hides ready for me in different parts of the Bay, but cannot go for them without men, and the expenses would consume all the collection. In fact, you can hardly conceive all present state of affairs in California. A cook, for instance, gets from $100 to $150 a month, and Kanakers $75 per month, to go in launches. How long this state of things may last it is impossible to foresee, but it is not probable that men can be obtained at justifiable wages by ships, so long as they can go to the mines and realize $16 per day, and this I am satisfied they can do for a long time to come. I have been twice to the mining region, and am satisfied of the fact that the gold is inexhaustible. The whole chain of the Sierra Nevada or Snowy Mountains of California, seems to abound with the mineral. There has, no doubt, been collected within the last months $1,500,000 at $16 to the ounce, which is the price allowed for it at the stores. Merchants from Chili and Peru have been purchasing it at $14 to the ounce; and now owing to the scarcity of specie, it can be had at $10 per ounce. It is now very sickly at the mines, and I dare not return there again. Can you imagine finding a slab of gold so large you have to chop it with an ax to make it small enough to move? Or a chunk of quartz so filled with gold that a hammer blow shatters the quartz, but the gold has to be cut from the vein? How about a ton of gold in a small surface cut? In these days when some of us have to be satisfied with finding a few flakes of gold, it is hard to believe such finds were actually made. It is even harder to believe that these finds were made practically in our own backyards! We hear of huge nugget finds in Australia, deep mines in South Africa, fantastic mines in South America and other exotic places. Most of us will never have the opportunity to visit these far away places. But maybe we can explore some of the places where fantastic finds have been made in our own area. All of our mining areas have their own special stories. Gold rushes to many areas were started by the mere rumor of a fantastic find. Many of these rumors proved false, but resulted in some of the lost mine stories that are now a part of our folklore. 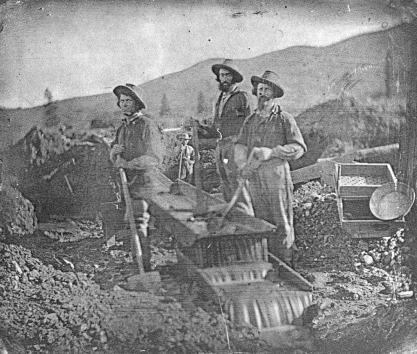 The early miners were primarily placer miners. Most were inexperienced; very few even knew what natural gold looked like! Placer gold was easy to recover and identify. 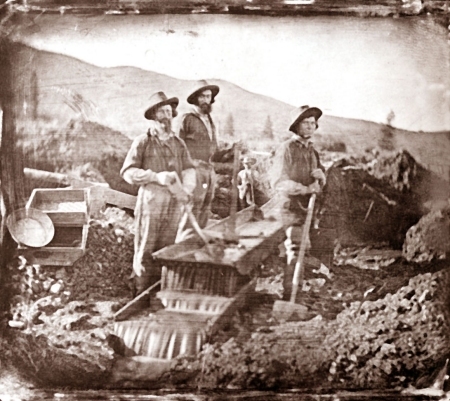 As the miners gained experience, many began looking for the source of the placer gold. It was found that the trace of gold could be followed upstream to the point where it stopped. Then by searching the hillsides above the stream, the lode source could sometimes be found. Some of these lodes were developed into valuable mines. Each mining area has a distinctive type of gold. Gold, in its natural form, is never found in a pure state. Other metals are always alloyed with the gold. The purity of the gold is determined by the percentage of other metals in the alloy. Each mining area also has distinctive sizes and shapes of gold particles. Some areas are noted for the size of the nuggets produced; other areas produce only microscopic particles of gold. 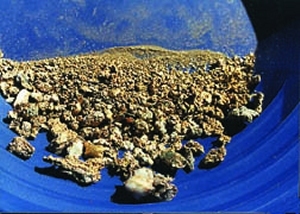 The type of gold in the area determines the method of searching for it. 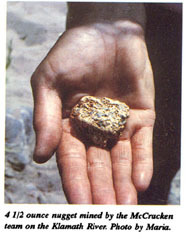 All placer gold originated in a lode vein. If large nuggets were found in the stream placers, they sometimes led to fabulous lodes. The early miners discovered many valuable lode mines and pockets by following the placer leads. Southwest Oregon is noted for pocket mines. Most of these were located by following the placer leads to the source. As a vein of gold weathers and wears away over the centuries, gold will spill down the hill or mountainside, spreading in a V-shaped pattern as it migrates down to the nearest stream. Some pockets produced only a few ounces of gold. Others, such as the famous Gold Hill Pocket, produced up to a ton of gold. Some miners specialized in pocket hunting. They developed an inverted V method of searching for pockets. When the placer lead stopped in the stream, they started digging test holes on the hillsides. As the rows of test holes progressed uphill, the inverted V pattern was established by the holes which produced gold. The pocket of gold was found at the point of the inverted V.
Some pocket hunters worked on the theory that pockets always occurred in groups of three. When the surface pocket was worked out and the vein pinched off, they kept digging and sometimes were able to strike a second and third pocket. 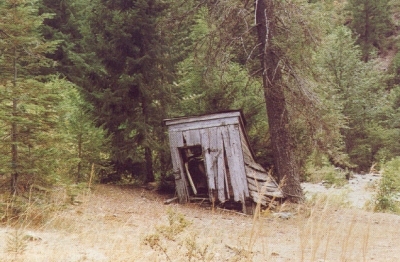 The first lode mine in Oregon State was a pocket mine. It was called the Hicks Lead. This small pocket produced $1,000 in two hours. It was later sold to a group of miners who built the first arrastra in Oregon State. The fabulous Gold Hill Pocket was discovered in 1857 near the top of a small 2,000 foot-high mountain. This pocket was a fissure-vein four to five feet wide and fifteen feet deep. The outcropping rock was literally tied together with gold. It was almost impossible to tear it apart with a sledge hammer. At least $700,000 was recovered from a very small area. With gold valued at $20.67 per ounce at that time, this works out to over $14 million at today’s gold price. Gold Hill is a landmark along the 1-5 Freeway two miles from the city of Gold Hill. 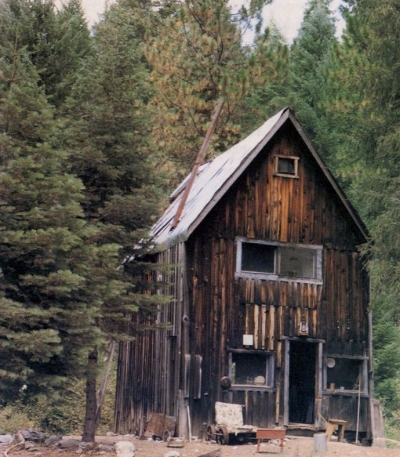 The Steamboat Pocket was discovered in 1860 near the headwaters of the Applegate River. Over several year’s time, it produced over $350,000. Compared to these two, other Oregon pockets seem minor. However, each was a fabulous find in its own right. At the time of their discovery, many of these pockets were made in extremely isolated areas. 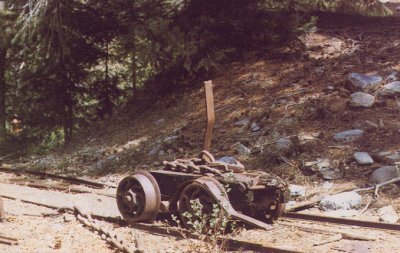 One of Oregon’s most famous pockets, the Briggs Pocket, may have been the re- discovery of a lost mine. During the Indian uprising in 1855, two men on their way to join the fighting found an outcropping of quartz. They each broke off a chunk, which was later sold for $100. They were never able to relocate their find. Almost a half century later, in 1904, an 18-year-old hunter, Roy Briggs, relocated the lost mine. This small pocket produced gold in slabs one inch thick and two to three feet long. A total of at least $50,000 was recovered from the vein 12 to 14 inches wide, 12 feet long and 7 feet deep. Reporters for the Rogue River Courier described the Briggs tent as having “gold in sacks, in cans, in bottles, in the mortar, in the gold pans, in tin cups and cooking utensils, everywhere”. This discovery was actually made in Thompson Creek near the Oregon-California border. Several large nuggets have been found in Oregon’s placer mines. A 204-ounce whopper was found in 1859 on East Fork Althouse Creek. Buck Creek produced the famous 80.4 ounce Armstrong nugget. A 34-ounce nugget was found in Brimstone Gulch. In the early mining days, and even extending well into this century, gold had no special specimen value. An outstanding nugget would be tossed into the melting pot along with the common gold. Most of our record-size nuggets have been lost as a result of this practice. Miner John Dodge took a mighty swing at the shale bedrock at his mine near the Yuba River, and stuck his pick in the gigantic Downieville nugget, which may have been even larger than the Calaveras nugget. When the monstrous heart-shaped nugget was pried from its resting place, it was weighed on a make-shift scale. A plank was balanced, then the huge chunk of gold was placed on one end. Small rocks were then placed on the other end until it balanced, then the small rocks were weighed. The pile of small rocks weighed 227 pounds. Then the nugget was chopped into three pieces to make it small enough to carry. Each piece was later sold for approximately $17,000. 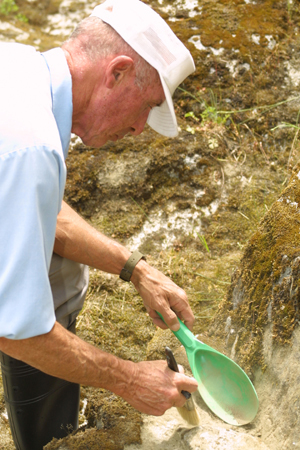 Have all the big nuggets and slabs of gold been found? I don’t think so. Several very interesting discoveries have been made in recent years. A California deer hunter tripped over a rock. When he picked the rock up, he found he was holding a fist-sized gold nugget. A Colorado miner noticed a rock by the road as he drove to work each day. When he stopped for a closer look, he found a piece of float weighing several hundred pounds. It was loaded with visible gold and is now in a Colorado Museum. Our chances of finding a large nugget or a massive slab of gold may actually be better today than ever before. New improved diving and dredging techniques now allow us to explore and work many areas of virgin ground. Underwater placers, never before accessible, can now be worked with ease. 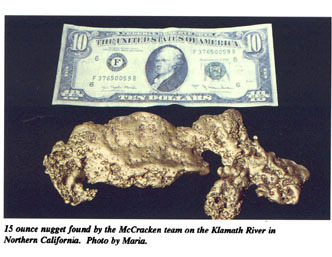 As just one example of many, the nuggets shown is this article were just-recently dredged out of the Klamath River by Dave McCracken on claims managed by The New 49’ers Prospecting Association. The development of new and improved electronic prospecting instruments may now enable us to locate deeply hidden veins. These deeper penetrating instruments may be able to locate nuggets the earlier miners missed by inches in ancient river channels. We now have many opportunities never before dreamed of. I am getting a serious case of gold fever just writing this. I’ll see you up in the hills. Good luck. About the Author: Roy F. Mayo was born a few years before the great depression of the 1930’s. His early life was spent in Western Oklahoma and Texas. He served in the US Army during WWIl, and has lived in Washington state since 1955. Having been a small-scale gold miner for more than 40 years, he has searched for gold in most of the western mining states. Roy has stated that he found gold in many places, but his richest reward has been the pleasure of exploring many historic places with his family. Roy started his writing career quite by accident in the early 1970’s. While searching an area in Idaho where a group of Chinese miners had been murdered, the local librarian encouraged him to write the story for reference material in the library. This later became his first book, GOLD AND STRYCHNINE. Now a world-renowned author, he has eight published books and is presently working on guide books showing gold locations in several of the Western states. These will be in the same format as his books, WASHINGTON STATE GOLD MINES and GOLD MINES OF SOUTHWEST OREGON. In the summer of 1850 the “Klamath River Indian Tribes” witnessed first-hand the ferocity of early American “Gold Fever.” White men soon came into the mountain forests of this winding river. At least three groups of prospectors ventured through Yurok and Hupa Indian lands into the territory of the Karuk people. Stories of hundreds of gold diggers coming into other valleys of California had come to the Klamath River Indians from Indian tribes like the Pomo, Wintun, and the Wiyot. Gold hungry men were coming into their territories. “White men like the rivers! White men dig up rocks,” said these peaceful Indians, bewildered by such behavior. One group of early miners, approximately eighteen men, traveled the millennia-old foot-trails of the Karuk people, up to a place of broad gravel bars and exposed bedrock two miles upstream from Clear Creek. For thousands of years the Karuk Indians lived along the river on similar “flat” campgrounds, ancient gold-bearing deposits of river gravel! The Karuk were a peaceful people. They believed that a great and peaceful race of white people lived here before the Karuk Tribe came to the Klamath River. They were uncertain of what they should do with regard to these white men. Were they the peaceful white people returning? Unfortunately, they would soon learn otherwise. Some white prospectors took advantage of the Karuks. 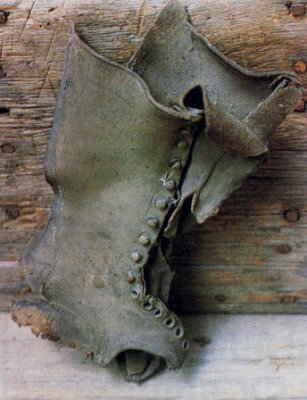 They used them for trail guides and as teachers of survival skills. 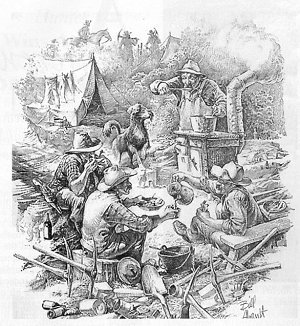 Prospectors had a rough time living on only the meat that they hunted or the food they’d packed with them. The Karuk Indians utilized salmon, deer, and elk as their primary meat sources. They also gathered and used more than two hundred species of plants. Nutritious acorns of the tan oak and other oak species formed a large part of their diet. The Karuks used nearly as many plants and herbs for medicinal and spiritual purposes. At times of peace and acquaintance, the two cultures learned many new things from each other. During times of conflict, powerful guns of the white men won most battles. Arrows and flint-knives had little chance against the power of guns. Revolvers like the .44 caliber Walker Colt and the .36 caliber Texas Colt gave the miners firepower. “Long-rifles,” like the .50 caliber Hawken, gave the owner the capability of killing a human, or a deer, at a range of 200 yards. The original 49’ers carried rifles, 5 and 6 shot revolvers, Derringers, pepperboxes, knives; or some such assortment. Outlaw miners in boomtowns were actually more of a danger than the so-called “wretched” Indians. Good amounts of gold were first found at a campsite now known as Wingate bar. Digging produced much gold! Trouble came quickly. Two miners were killed by the Karuks at Wingate Bar, just north of the large Karuk village of Inaam, (Clear Creek). To avenge the killings, the white men formed a battle group. In a raid at first morning light, they killed all the Karuks present. Only a few got away. All the Karuk wood-plank homes were burned. Sporadic fighting went on for perhaps several weeks, with repeated attacks on the white men. These attacks finally caused the prospectors to pack their animals and head back down-river. They forded the river and climbed out of the river canyon, crossed the rugged terrain of the south Marble Mountains. It is believed that they took this route to avoid the large Karuk villages at the mouths of Ti Creek, Salmon River, and Camp Creek. There were seven villages at the mouth of the Salmon River. It was the “Center of the World” for the Karuk Tribe. They ended up in the Salmon River canyon, making winters’ camp at Brazill Flat (named after the great-great grandparents of the author.) This was at Forks of Salmon; land of the Konimihu Shasta Indians. This second party was headed for the Scott River. However, they must have traveled either through Seiad Low Gap into Horse Creek, or went up Johnny O’Neil Ridge and down Hamburg Gulch. They missed the mouth of the Scott River. They traveled up the Klamath River as far as the mouth of the Shasta River, in Shasta Indian territory. It’s believed that they wintered in the area soon to be called Thompson’s Dry Diggin’s; now known as Yreka. Gold was found there, but the land was dry; a high desert land. Gold was found in the ancient mixed soils of the valley bottom, including the roots of the bunch grass. The third party searching for gold in these mountains in 1850 included the man now known to have made the biggest gold discovery in the Klamath Mountain Province, John Scott. It is still uncertain exactly what route they took before finally ending up at Scott’s discovery site of nuggets at Scott Bar. (The largest nugget found in later years, found by Wade & Lindsey, was “five inches long, three inches wide, and weighed 16 pounds!) It has been reported that this band of miners came inland from the port town of Trinidad in California. In the next several years, we know that supplies were brought to Scott’s Bar by way of Trinidad, Blackburn’s Ferry (Cappell Creek,) and the wind-swept summits of the Marble Mountains. Later supplies were brought by pack trail (named the Kelsey Trail after one of the mule packers) from Crescent City over the mountains of the South Fork of the Smith River, Bear Peak, and the northern Marble Mountains. In 1851, the prospectors who had wintered near the Forks of Salmon, at Brazill Flat, lived through the winter pretty well. However, in the early months of spring they were surprised to see other eager and gold-hungry miners scurry into the Salmon River country. The new group crossed the Salmon Mountains before winter was really over. Spring snowstorms made life miserable for these hasty prospectors! As they waited for warm weather, they ended up eating all the stores of the miners already there. This was called “Starvation Times” in the Salmon River! The history of the bow and arrow dates back over 25,000 years, as well as man’s use of the horse as a riding and pack animal. How much further back does the history of mining and prospecting date? No one can answer this question for sure. The first written account of a prospecting party was done in glyph form by a captain of Egyptian infantry, where a party of some fifty men were embarking on a journey to the present-day land named Iran. This was five centuries before Christ. Though reduced in numbers by the end of their journey, they brought back gold. The Pre-Inca civilization in the land we now call Peru was deserted for some reason about 20,000 years ago. They not only could prospect and mine gold and silver, they could plate gold upon objects! Welcome to an ancient fraternity – gold mining! Well then, we have evidence that man has been looking and discovering for one whale of a long time. Surely he has looked at every square inch of the earth’s surface for the sources of silver, gold, platinum and, up until recently, lead! – and has found every possible source of these metals and mined them all out, right? Umm, I don’t quite know how to write this any other way than to report that the answer is no. That is, he may have looked at many of the sources, found some of them to be sure, and then wandered back to what he knew of as civilization. . . and then couldn’t find the place again. Or, he caught a fever and died or got shot in an argument over politics and couldn’t recover from the subsequent wounds. There are many instances where the discovery was made and the “natives” interrupted the process of removal and enforced strict “immigration regulations” by force of arms and left no survivors. Arrastras, ancient devices to crush stone and free valuable metals, have been found all over the West, from Washington State to Texas. Pre-Roman in origin, they have been used throughout the world to crush ore. They mark spots where ore was carried for handling. They would also mark the spots where nearby mines had been worked in the distant past. There is hardly a spot on earth larger than a ten dollar bill that does not have tales of lost mines and buried treasure connected with it. And one could spend three or four lifetimes just investigating the ones in his own neighborhood, unless he sharpened his investigative wits and began looking for hard evidence alone. An arrastra had a circular stone floor/ foundation. It was fitted stone; good cement was not invented until the late years of the last century. Some did, however; use pigeon’s blood and ground calceous rock, but it was a formula not widely known. In the center of the floor you would find a hole that accommodated the pivot that the stone-drags rotated upon. If the area had seen much use, the floor would be worn quite smooth with grooves worn into it as well. Some had gutters along the sides to collect the amalgam. When the stone had been ground, mercury was mixed in by hand to seize the gold or silver. The powdered stone was then washed or blown away and the mercury decanted into containers for transport to a refinery. Arrastras can be found all over the Southwest, the Northwest as far back as Minnesota, and following the western edge of the Mississippi River. The Spaniards had hundreds of years to explore the region, and they really did, all the way into present-day Canada. A very famous lost mine of Spanish work lies within the White Sands Proving Grounds in New Mexico. It was re-discovered as late as 1949! The two men who discovered it had a slight falling out over the division of spoils, and one man was shot to death in a gun duel. They brought out actual bars of gold from a vast hoard that had been buried and hidden from view since the late 1600’s, when the Indians in New Mexico rose up and murdered everyone of Spanish-type and ran survivors back into Mexico. Wherever they could, the Spanish would hide their mines before leaving, having every intention of returning. In many cases, they were killed before they could return, and the Indians would pull the place apart so that no one would know where the mine was located. The Spaniards were kept out for a hundred years, and many of their operating mines were never again located. Some mines have actually been re-discovered! King Solomon’s mines were found again in 1983 by a helicopter survey-group in the middle of the Arabian Peninsula, hidden from all but aerial view. The slave barracks walls are yet standing after two thousand years! One could almost write a tone poem on the irony of that piece of data; the most durable of all structures – the slave barracks, complete with bronze chains, waiting for more occupants down through the millennia. Another lost mine that may have been found is the famed Tillamook gold mine of the 1820’s through the 1840’s. Trading posts in McMinnville and Forest Grove in the Oregon Territory used to be visited by Indians that traded raw gold for the articles they wanted. They would never tell anyone where they obtained the gold, and efforts to follow them to its source were all defeated. On her deathbed, one Indian lady told her paramour the general location, and he spent the rest of his life searching for it. He gave me an odd look and began emptying a pocket of ancient coins, the copper closures of an old pocket-purse, and showed me photographs (Polaroids) of a very rusted musket barrel, and some bones that looked very much like a human skeleton, and views down into a very steep canyon with a waterfall and the entrance to what could be a mine adit or a cave. Then he showed me a sample of rotten quartz with gold rattling around in it, loose! The coins were all pre-1843. The musket barrel was from an old Hall Carbine, Army issue for the cavalry in the 1840’s. He reported that in the opening of the “cave” as he called it, there were old timbers bracing the entrance that gave off a funny smell. It was evidently an adit, from the description. The last time I saw the man, he was driving down the street in a brand new $40,000 pick-up truck and looking like a Prince of the Realm! An old friend of mine told me the reason almost all of my own efforts in the field of treasure hunting and looking for old mines had amounted to zilch was because of my lack of proper research. He would happily spend two years researching a locality before he ever loaded his truck up for the trip to it. It must be true, as the only real find I have made myself was in his company on a trip to a ghost town in Utah. He knew the name of every prominent citizen that had lived there. He knew the precise location of every likely target to search. In order of importance, he always searched the assayer’s office and home first. The Sheriff’s office came second, and then the Mayor’s office and home. Next came the Red Light District, as those girls were very busy! Why the assayer, of all people? They were the biggest uncaught felons in the territory! They would call in a mine owner and demand several burlap bags of ore to test in a “cross-sectional analysis.” After obtaining these bags, they would take what was needed from each bag, assay it, and refine the remainder and keep it for themselves. They would then give over the results of the assays to the mine-owner, charge him three dollars for each assay, and hide the remainder for a rainy day. How much ore is needed for an assay? About five ounces, no more. After searching the assay office in this ghost town, we found nothing. It was 108 degrees in the shade, and the only shade was up against the bank behind the stone foundations of the site. I staggered over and leaned up against the dirt. I had not turned off my metal detector, and it gave a loud signal! Hidden in the bank were 52 boneash, half-pint testing cups with about an ounce of melted gold, under glaze, stacked one within the other. How come the assayer had never returned to claim his stash? He was a millionaire, many times over and possibly couldn’t be bothered with a mere 52 plus ounces of gold! In one Idaho ghost town, this same person found six unopened crates of 1879 Springfield rifles, hidden in the foundations of an assayer’s house. And downtown, in the hollow walls of his establishment, he found four large gold-pan sized ingots of gold and three of silver that had been melted down from ore. The assayer apparently used a steel gold pan as a mold, so the resulting slug would fit into the wall without notice. Each of these ingots weighed over sixty pounds. What does all this mean? One thing for sure, our ancestors were a busy lot, full of enterprise and hard work! Mines and treasures have been discovered, lost again, forgotten about and re- discovered down through the ages. It is certainly not a new thing in earth’s history! Nor is the violence that often accompanies such discoveries.